A reverse mortgage can open up a world of freedom and peace of mind to homeowners wanting to enhance their lives and help secure their finances. Using the equity in your home, a reverse mortgage can eliminate your monthly mortgage payment and generate cash for anything from a dream vacation to a new car to helping your children buy a house or grandchildren to attend college. Lineage Lending is a team of experienced originators who have helped countless California homeowners increase their income and achieve financial stability to live a secure and rewarding lifestyle. Our years of expertise helping people obtain a reverse mortgage in California enables us to provide a smooth, efficient and personal loan process that is designed to serve the unique needs of every client. 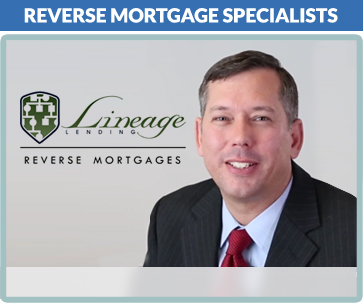 A reverse mortgage is a serious decision and it’s important to work with specialized reverse mortgage lenders. The experts at Lineage Lending will discuss your cash flow needs with you and then use our reverse mortgage calculator to provide an accurate idea of how the equity in your home can go to work for you. Give us a call & together we will assess your financial goals and review reverse mortgage pros and cons to determine if a reverse mortgage is right for you. We stand apart from other reverse mortgage lenders in our philosophy of client inclusion. From the first meeting, we take a personal interest in our clients and their unique financial requirements. All client questions are answered thoroughly. This kind of personal insight allows us to look beyond cold figures & charts to give our clients and their families solid solutions to real world financial challenges.